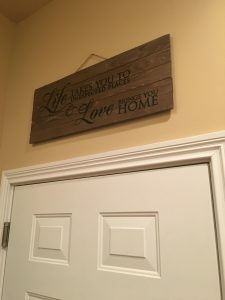 I knew I wanted something over the door to the garage with some type of message reminding family they are loved each time they leave the house but I wasn’t sure exactly what I wanted. I had in mind something that says to be safe, have fun, and come home, though much more elegantly worded. 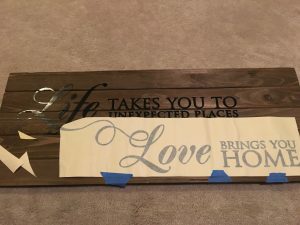 I found a set of adhesive wall letters which says, “Life takes you to unexpected places, Love brings you home”. This was the exact sentiment I was looking for, but I didn’t want to just put the letters onto the wall. 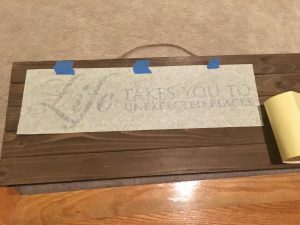 I wasn’t sure what I was going to do until I ran across a blank wooden sign which just happened to be the perfect size for the wording I had chosen. 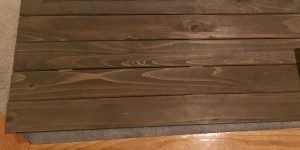 Even after purchasing the blank wooden sign, I wasn’t sure my plan would work. 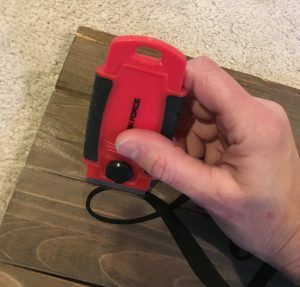 Will the adhesive lettering stick to the wood? Would the letters line up? Would the finished product be something I’m proud to hang on our walls? 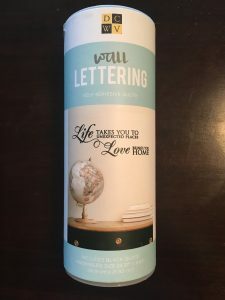 I began with the words which belong on top and following the directions on the package, I placed the first sheet of words. 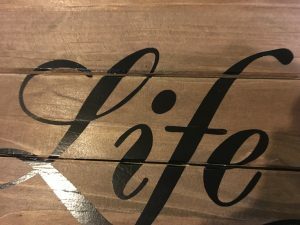 The flowing script from Life and Love were designed where they could touch, so I trimmed away the extra backing above the swirl to make it easier to line the lettering up perfectly. After getting both sets of letters applied to the sign, I used a box cutter to cut the letters where they crossed over the slats. I wanted to make sure it didn’t look like I just stuck the letters on a board. 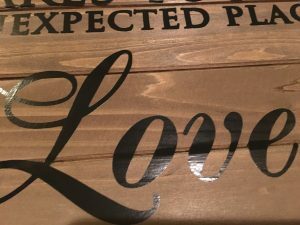 I wanted it to look like the board and the letters were made for each other. After cutting all the letters which crossed over slats, I used a toothpick to adhere the letters to the top and bottom of the slats. 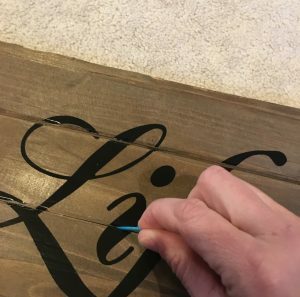 The before close-up below shows how the lettering looked when it was stretched across the slats, a the after shows the lettering after I cut it and adhered it to the tops and bottoms of the slats using the toothpick. I hope you like the finished product. I still have to work on selecting a new paint color for the hallway. But first, I plan to arrange all of my new command center finds so that in the event I hang something and need to move it for whatever reason, I can patch the wall before I paint it instead of trying to patch and touch up paint after. Well, that and placing my finds will be more fun than painting.